When you are catching fish in a particular spot, it is difficult to tear yourself away. So at sunrise this morning I found myself back to the south of the old oyster jetty, on the mainland, opposite Bribie Island. I started at about 6.00 am, just on first light. High tide would be just after 8.00 am. The wind was a very light south-westerly. From 6.00 am to 8.00 am, all I could find were a couple Pike. I often find the last hour of the run in tide is difficult. I think the fish need a bit of current to get them in feeding mood. When the water is completely still, at high tide, they just stop biting. Around high tide I was also limited by the water depth, to within 30 metres of the Mangrove fringed shoreline. Around 8.30 am, as the tide started running out, I caught my first Flathead of the day – 42cm long, on a 1/6th 1/0 jighead loaded with a GULP 4” Minnow soft plastic in the Pumpkinseed Colour. As the run out tide grew stronger and the water level dropped, I walked further and further south, catching Flathead all the way along the big sandbar. I turned around when I reached the green channel marker and waded back up the Passage, casting into the run out tide. I swapped between the Pumpkinseed and Pearl Watermelon colour soft plastics and both caught fish. 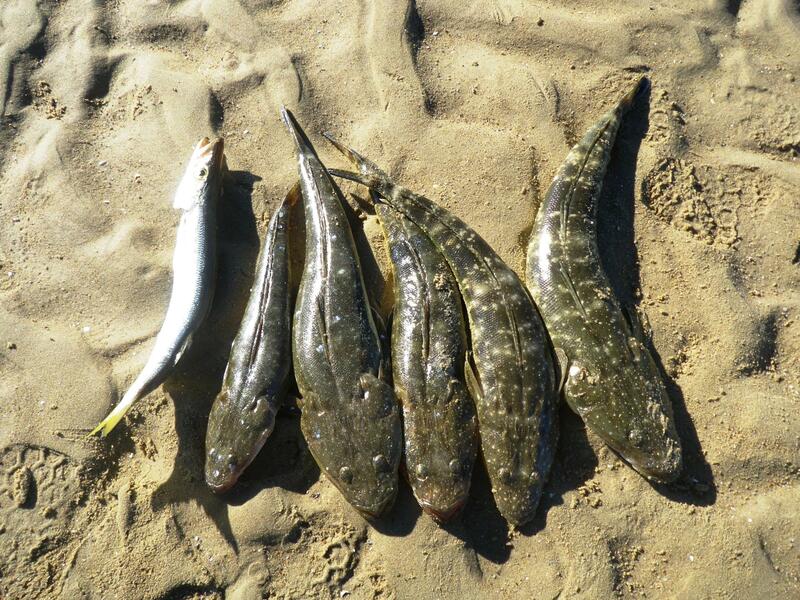 In total I caught 11 Flathead, of which 7 were over 40cm – the biggest was 61cm. I caught 4 fish on the sand right next to the green channel marker. All the fish were caught in less than a metre of water. I finished up back at the bridge by about 11.00 am. All the fish caught today were released, so get out there and catch them! I decided on Bribie Island again today. If you fish the flats on the mainland side of the Pumicestone Passage you are fairly sheltered from a cold south-westerly wind. The wind was forecast to be a 10 -12 knot south-westerly, but it was a good deal lighter than at 5.00 am, when I arrived by the bridge across to Bribie Island. I pulled on the waders and beanie and wandered out under the bridge lights, on the island side. There were a few lightning flashes over towards Moreton Island and the stars were blocked out by low cloud. I fished around the bridge pylons and almost immediately, caught a few Pike, but there was not much surface action. The tide was running in and high water would be just before seven. 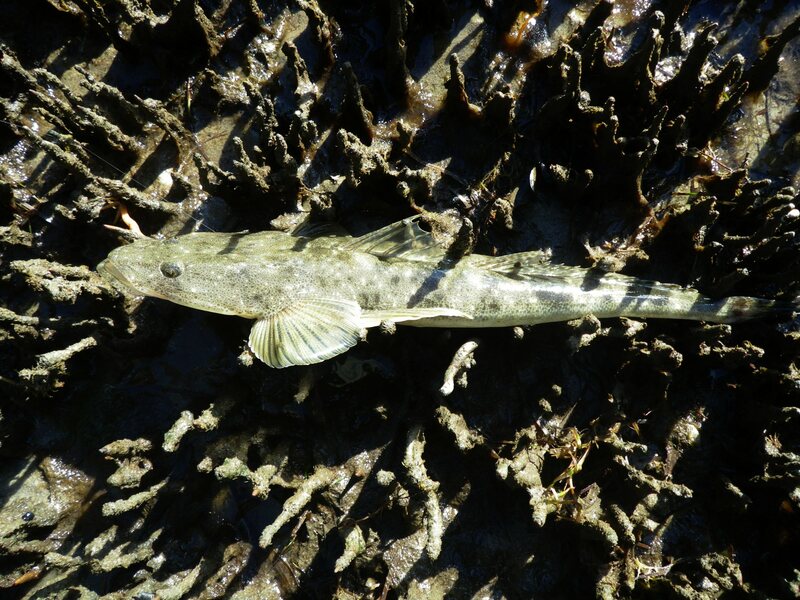 There was now plenty of water close to the Mangrove roots and I concentrated on the area just to the south of the bridge, where I often see Flathead ‘lies’ at low tide. After a few casts with a GULP 3” Lime Tiger Minnow soft plastic, on a 1/8th 1/0 jighead, I was on to a fish. It struck hard, but it was only small – just under 40 cm. In the process of releasing it, it gave me a good spiking in the side of the thumb. I don’t know what’s on the Flathead spike, but there must be some kind of anti-coagulant, because whenever I get spiked, the blood just pours out – not ideal when standing waist deep in water in the pre-dawn light. I moved gradually south, about 20 metres from the shore, casting all around. I continued to get the odd Pike but as the water slowed on the high tide, everything went very quiet and I had no bites for about 90 minutes. Then as the tide really started to run out I switched to a heavier 1/6th 1/0 jighead and a bigger GULP 4” Minnow in the Pumpkinseed colour. 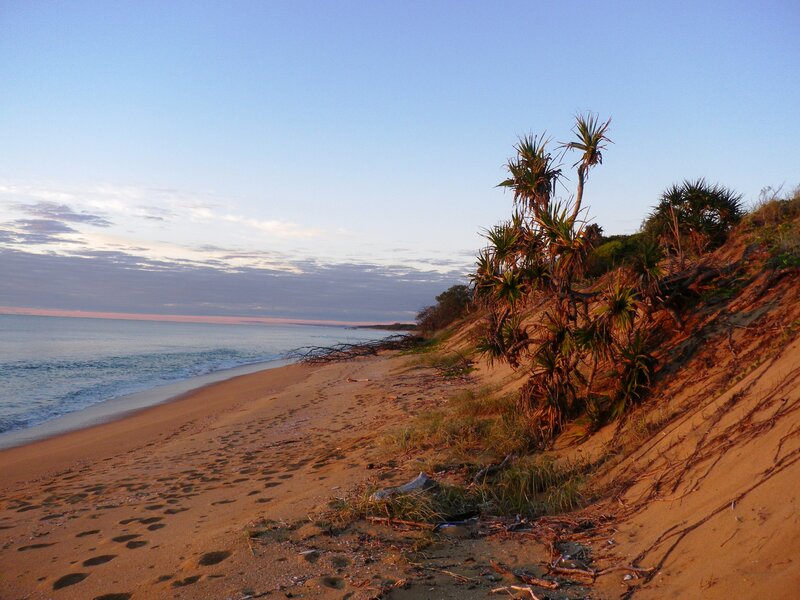 I was standing to the south-west of the long sandbar at the Sandstone Point corner and casting my lure over it and hopping it back with the run out tide. Suddenly the line went tight and I had a fish. 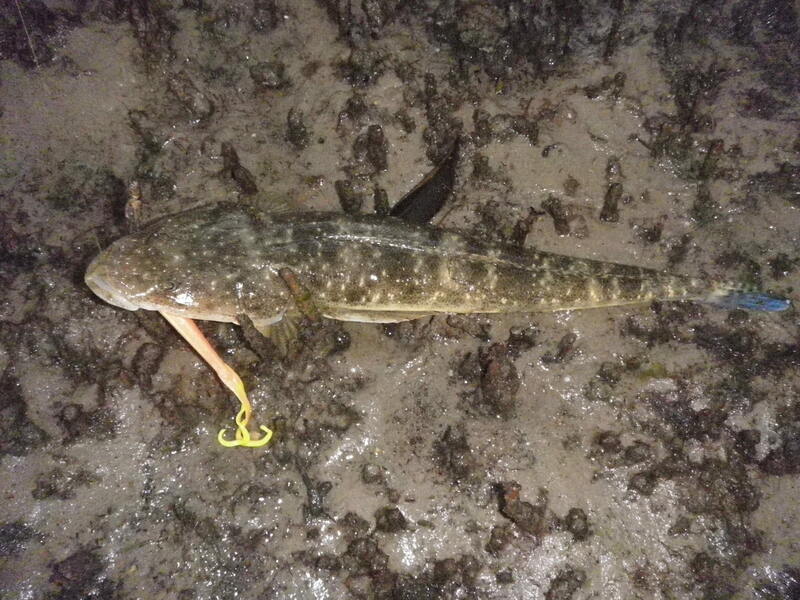 I towed it back to a gap in the Mangroves – it was a nice Flathead at around 61cm. Plenty of fish in our fridge, so I let it go. The wind was getting up now and as this was a fairly sheltered spot, so was the boat traffic. I caught a couple more fish around the 40 cm size and then finally, just to the north of the oyster jetty, I got a 51cm Flathead. I had caught 4 of the 5 Flathead on the Pumpkinseed coloured soft plastics and the session was a good reminder of how useful this colour can be. At around 9.30 am I gave up and headed home for a warm shower. Back up to Bribie Island, in search of Flathead. I was pleasantly surprised when I arrived around 5.00 am. It really was not too cold and the south westerly wind was far lighter than the predicted 15 knots. High tide had been at about 4.00 am so there was still plenty of water around the bridge pylons. I decide to start on the island side and as soon as arrived I could see and hear the Pike and Chopper Tailor breaking the surface as they grabbed smaller baitfish/ shrimps. I started with the GULP 4” Minnow soft plastic in the Pearl Watermelon colour, rigged on a 1/6th 1/0 jighead. I was using a 12lb leader and fishing with my Loomis GL2 light spin rod matched with a Shimano Stradic 3000 reel. 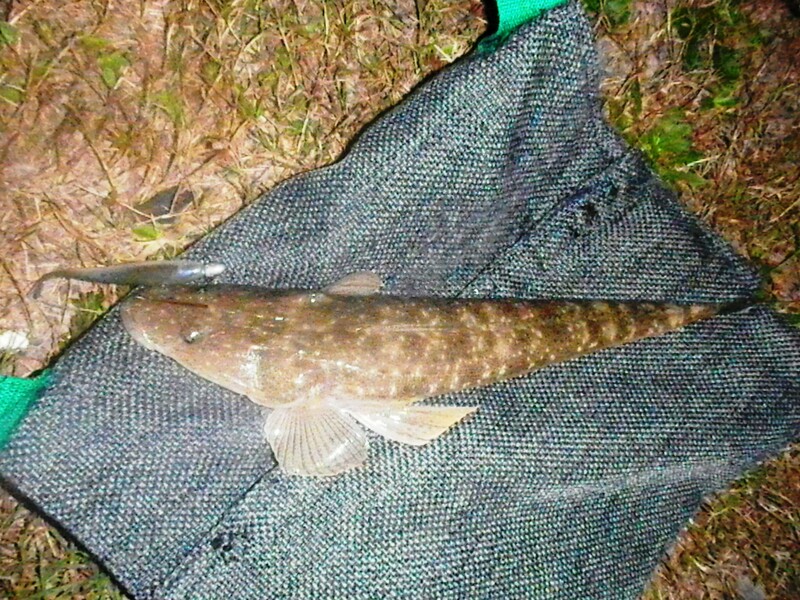 After a couple of casts I caught a small Flathead – just about 40cm. It must have been lying in the shadows beside the first pylon, in no more than 40cm of water. I released it. The next cast gave me a Pike that was bigger than the Flathead and then, a few casts later, a 25cm Chopper Tailor. Before the tide got too low I decided to go back over to the mainland side and fish around the pylons under the bridge lights. I stuck with the same soft plastic and jighead and worked my way around the pylons. I waded quietly, stopping frequently to pepper the spots where I have caught fish before. 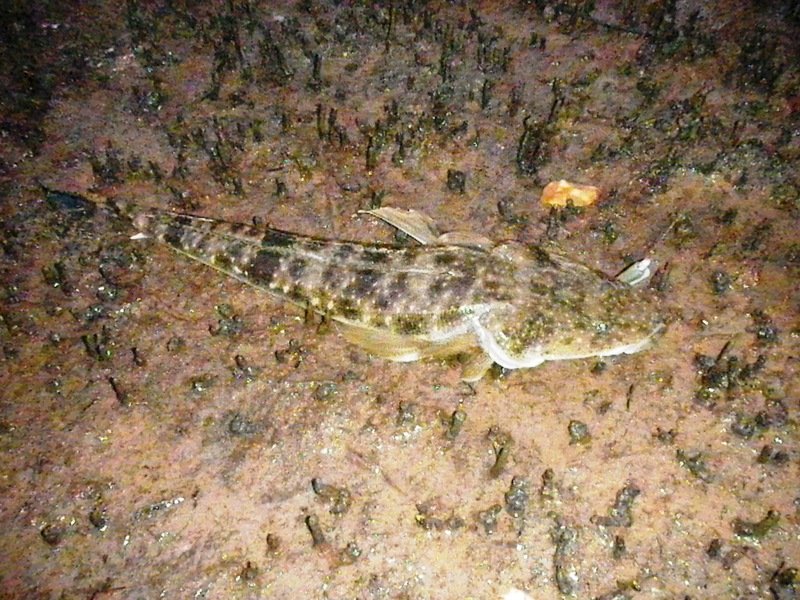 This soon paid off and just south of the bridge, about 6 metres from the mangrove line, I caught another Flathead. It was around 50cm long so it went in the keeper bag. There was the glow of dawn on the horizon but the sun was still not up. It was cold now, but this area is shielded from the westerly breeze. The water looked fairly clear so I switched to a bigger GULP Crazylegs Jerkshad in the Curry Chicken colour – basically a flecked combination of pink and yellow with a forked curly tail. After a couple more casts I caught another fish – despite the bigger lure it was a much smaller Flathead at around 42cm – Keeper No.2. The sun came up and I continued wading south, past the old oyster farm jetty. 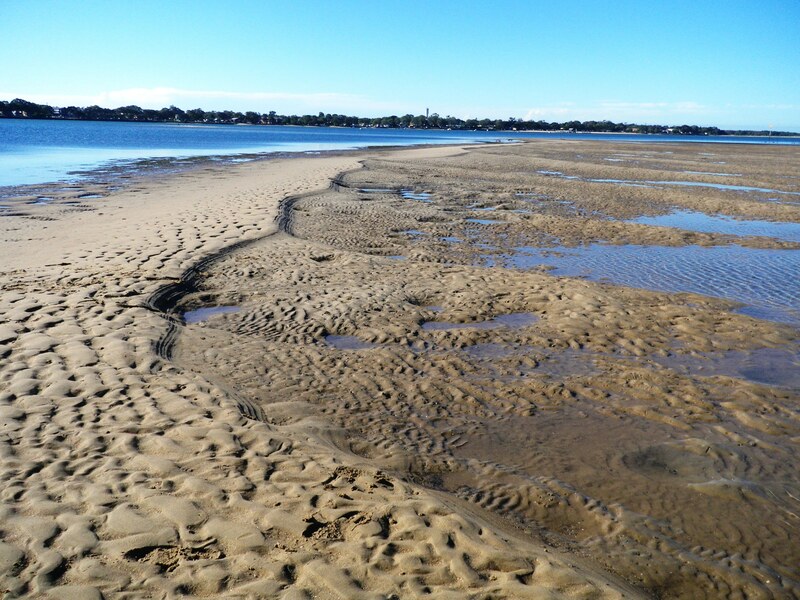 I walked right along the big sand bar – that is exposed at low tide, casting on either side. I reached the pole that warns boats about the remains of the old oyster racks and then turned north again and started wading back, alongside the sandbar, in waist deep water. I swapped back to the Pearl Watermelon Minnow. I was casting back at the sand bar and after about 50 metres I hooked another fish. 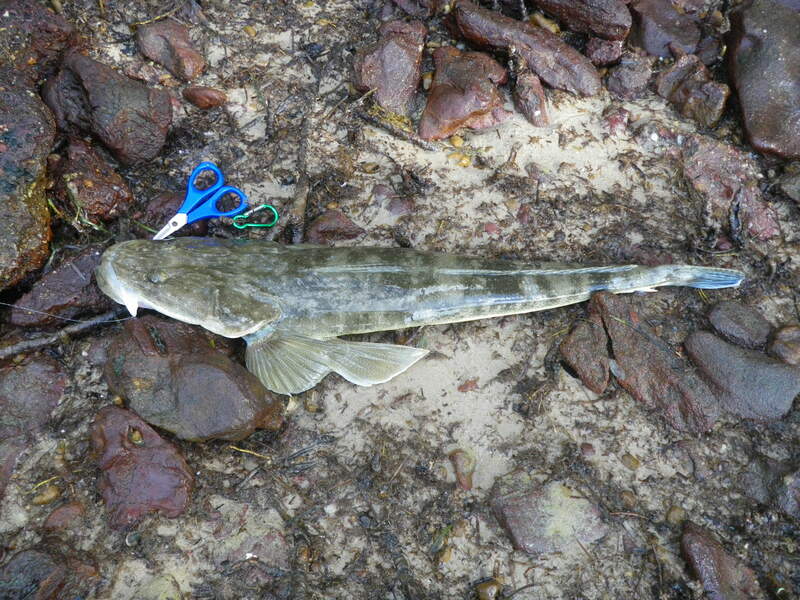 It was another Flathead, about 48cm long –Keeper No.3. I dragged it up onto the sand and then resumed my course towards the oyster jetty. Over the next half an hour I got two more slightly bigger Flathead (Keepers 4 & 5) and a monster Pike – well over 45cm – which I kept for the cat. I now had my bagful of fish and so I decided to call it quits. The forecast wind was really arrived and was starting to blow so I headed back to the car and then the gutting table. It had been another good fishing session in the Pumicestone Passage. I woke up at around 5.00 am with the wind rustling in the trees. Out on the beach at Wreck Rock, it was a howling south-easterly, so I drove up the track to 1770. I was hoping to have a fish on the sheltered side of the headland but when I arrived, I realised that even that was too blowy. 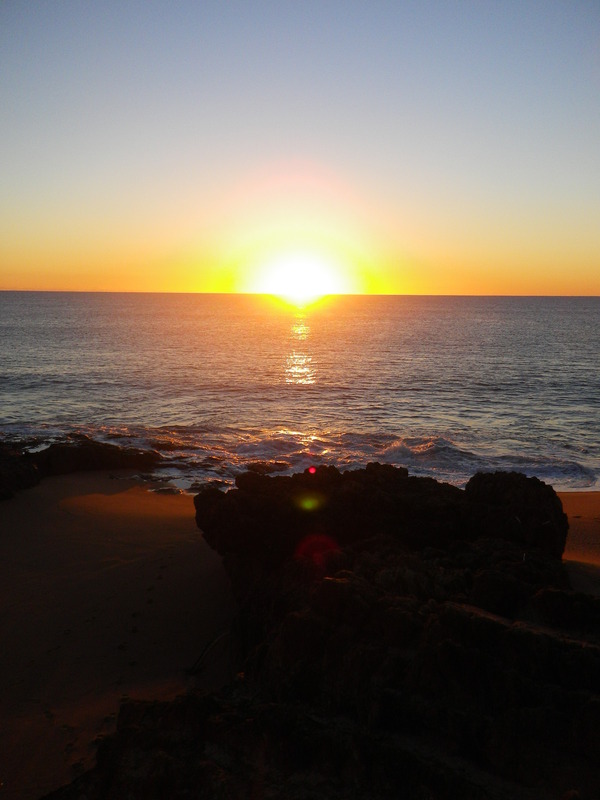 I watched the sunrise and then had a coffee and some breakfast from the bakery at Agnes Waters. I found a sunny spot and pondered where to fish next. I decided to head for the northern end of Flat Rock beach. At the end of the beach there is rocky headland known as Red Rock. It’s a long walk – about 2.5 km, but the sun was shining and on the way there, at least, the wind was behind me. I stopped to cast in a few spots along the way. I had to use a ¼ oz size 1 hook jighead to make an impact on the wind. I was fishing it with the GULP 3” Pearl Watermelon Minnow which resembles the small whitebait that the Tuna have been feeding on. I caught a few Dart and Whiting towards the northern end of the rock, where the water was running out of the long gutter and into the ocean. Eventually I reached the end of the beach and clambered over the rocks known as Red Rock. There is a small corner in this spot that is sheltered from the south-easterly winds and a couple of hours either side of high water, it is a good fishing spot. I cast the Minnow soft plastic close into the foot of the rocks and immediately got a few bites. Next cast I caught a small Dart and then a Stripy Perch – about 30 cm long. The fish were in close to the rocks in just over a metre of water. After half an hour I was running out of water and I had not caught anything worth keeping. 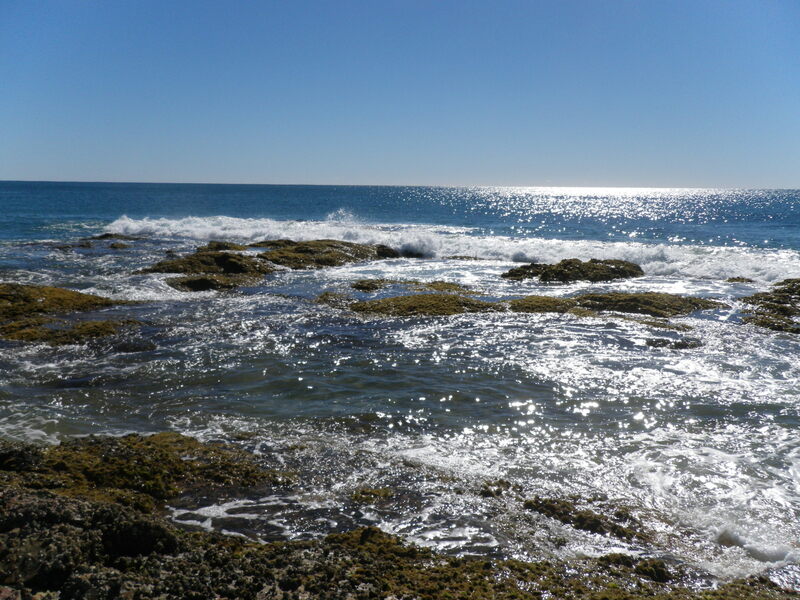 I headed back over the rocks to Flat Rock and waded out onto the northern tip of the rock. I then walked back south along the top of the rock, casting all along the edge. About 600 metres from the northern end of the beach there is a gig drain through a gap in the rock. I cast out in front of it and a fish grabbed the lure and made a short run. I struck but the fish dropped the lure. I paused and struck again – zzzzzzzzzzzzzzzz I was on. The fish swam straight under the rock and soon I could feel my line rubbing every time I tried to put some tension on it. I let it go slack and after 10 seconds or so pulled it tight again. I made a bit of head way but then zzzzzzzzzzzzzzzz straight back under the rock. I employed the same procedure 3 or 4 times and eventually the fish swam out. 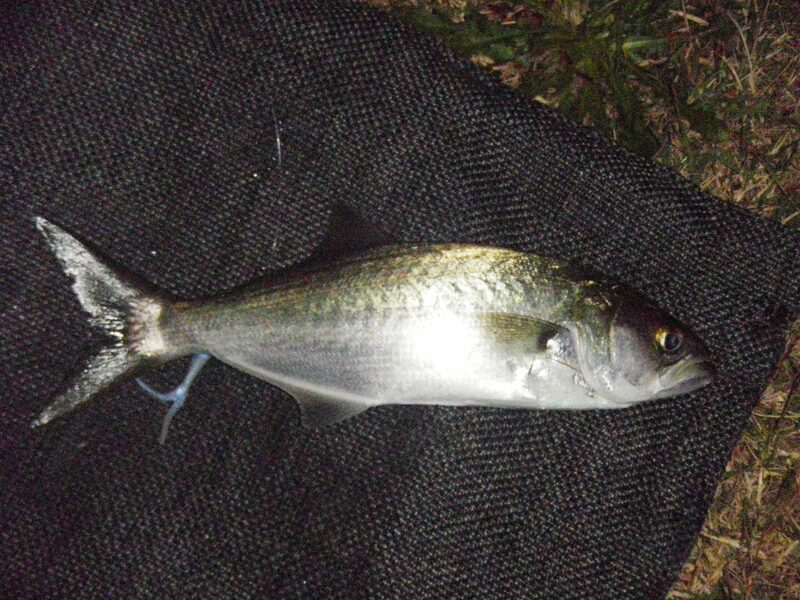 It was a big Blubber Lip Bream around 50 cm long and over 2 kg. I bled and gutted it straight away and decided to keep it for supper. 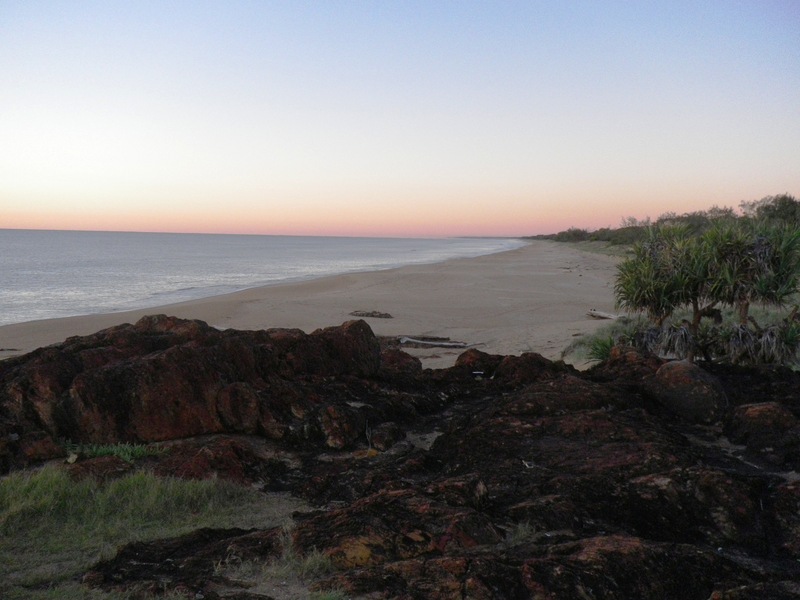 I made the long trek back along the beach – into the wind and decided it was time to head back to Brisbane. I have read a lot of criticism of the taste of the Blubber Lip Bream but my mob scoffed the lot at dinner – the fillets tasted pretty good pan-fried with lime and fish sauce. It had been a great week but the fishing had been hard work. I was constantly struggling to find the better fish and the Tailor and better sized Bream, really had not shown up. By the next full moon I would think the Tailor will be more prolific around 1770 – particularly if the Whitebait thicken up their numbers. The water needs to cool a bit more for the winter species, but I think the fishing will get better and better this year, so I hope I am back up here before too long. On Sunday morning the weather was beginning to change. The breeze was moving round from the south west to the south east. It was much warmer and conditions were good as the south easterly was still light. I had worked out that low tide presented the better fishing opportunities at Flat Rock and Wreck Rock and so, with high tide a few hours after dawn, I headed back to Middle Rock and more specifically the set of rocks in the middle of Middle Rock. Jupiter and Venus had been bright and visible in the eastern sky just before dawn, all week. Since about Thursday, Mercury was also clearly visible. Venus was so bright that it cast a clear light across the water. It had been similarly bright when I was fishing down at Iluka, in NSW, last month and I wonder if it has an effect on the fish. I was fishing with the heavy rod – the Daiwa 9’ 6” Demon Blood, matched with a Shimano Stradic 6000 reel, loaded with 20lb braid and a 30lb fluorocarbon leader. I was hoping to encounter some bigger fish at dawn and thought that the cold snap would have got the Tailor going. My camping neighbour had caught a few off the beach to the south of Wreck Rock, the evening before. They had taken cut up Pike baits about an hour after sunset. I rigged up with a GULP 5” Pumpkinseed Jerkshad soft plastic lure on a 3/8 oz 2/0 jighead. I cast all round the rocks in the pre-dawn light. I could not raise a bite so I dropped down to a ¼ oz 1/0 jighead and 16lb Fluorocarbon leader and cast around again. 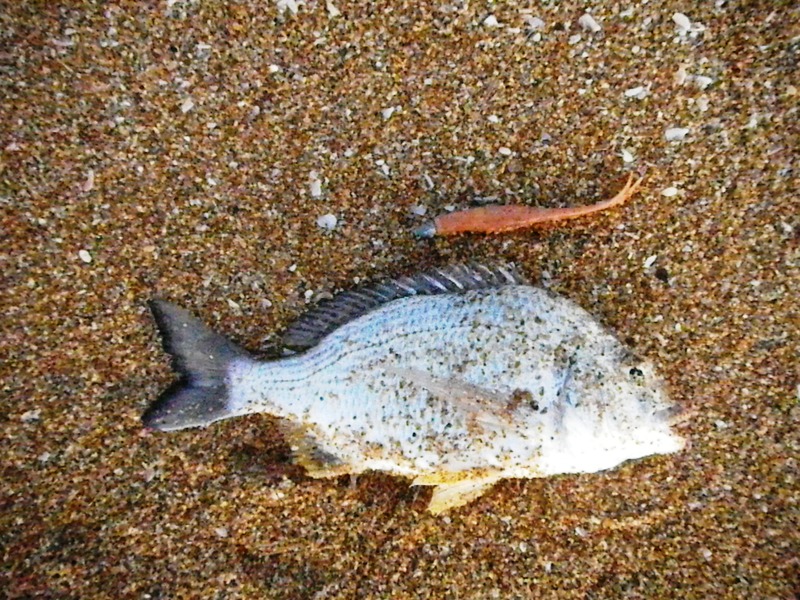 Third cast, in very shallow water, only a couple of metres from the beach, I had a fish. It was a Bream about 30cm long. I released it and cast back in the same spot. I hooked up straight away – it was another Bream – slightly bigger at around 34cm. I carried on but all I could not find anything bigger so at 8.00 am I went back to camp for breakfast. Whilst there were fish around it was becoming clear that this week was right in the middle of the changeover between the dominance of the warm weather species –Tuna, Mackerel, Dart, Whiting and the emergence of the cold weather species – Tailor, Bream, Flathead. The air temperature had been bitterly cold but the water was still very warm. It was hard work trying to figure out what to try next! After breakfast I decided I would fish the run out tide at Flat Rock. The moon was almost full so the tide would be very low. I arrived just after 10.00 am and the long rock was already exposed. I waded out and climbed up onto it. I was back to the light spin rod, using a 1/6th 1 jig head, 12lb leader and 2” and 3” GULP Shrimp and Minnow soft plastics. 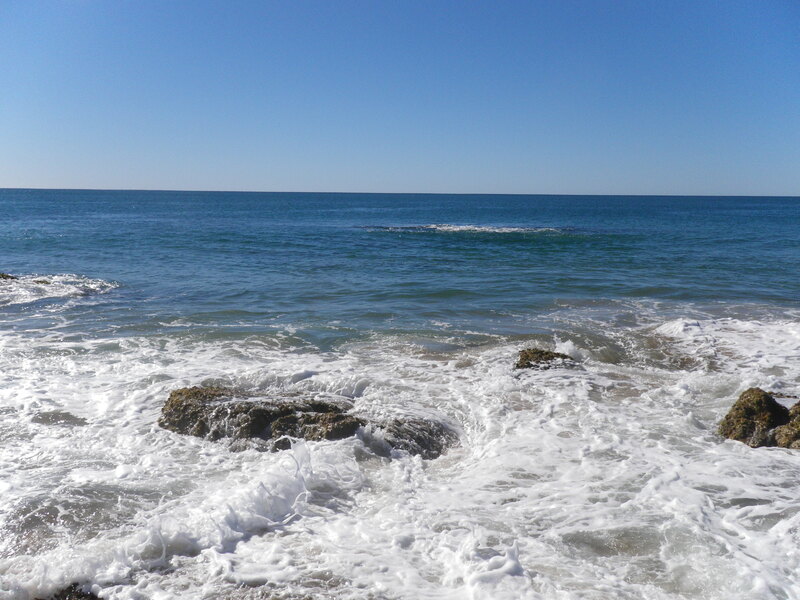 For the next few hours I walked all the way along the rock to the northern end of the beach, casting out over the edge. There was no shortage of fish but the problem was size. Everything seemed to be under 30 cm long. I caught Whiting, Flathead, Bream, Stripy Perch, Dart and Long Toms, but nothing was worth keeping. By 2.00 pm the wind was getting up and the tide was running in so I gave up. 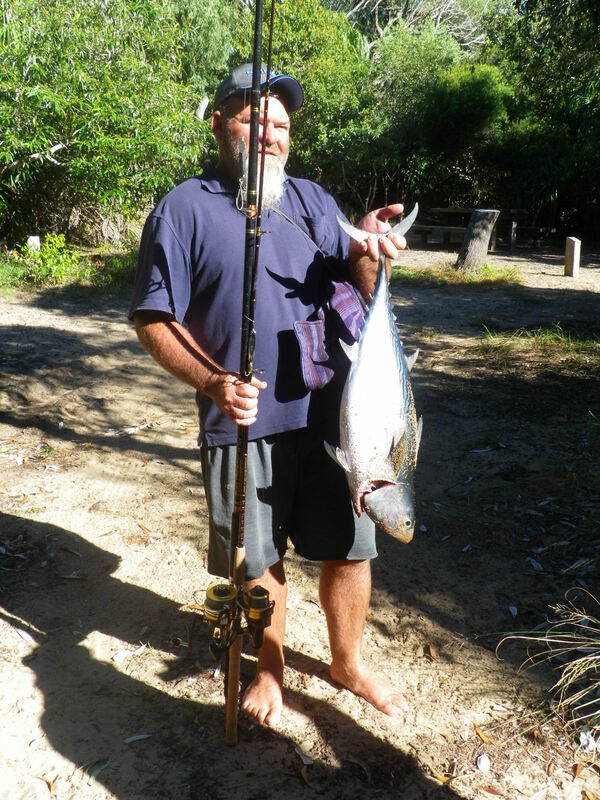 On Friday evening the keen fisherman camped nearby told me he had hooked up to a freight train Tuna, off the beach, in the early afternoon and unfortunately pulled the treble out. He had spent the rest of the day running up and down the beach trying to get his metal slug back in front of the fish but they just never came close enough. I decided to try the slugs in the morning down at Flat Rock where I had also seen the Tuna working. As the sun came up I cast and cast and cast in the direction of the feeding Tuna – but they just never quite came close enough. After a couple of hours I gave up and went back to camp for breakfast. I was greeted by my neighbour whose persistence had paid off and finally he had a good size Mac Tuna. He had eventually caught up with a school that came into less than 3 metres of water, only about 25 metres from the shore, about 1km south of Wreck Rock, along the beach. He had followed the birds and dead Whitebait that littered the beach until he saw a boil of feeding fish on the surface close in to the beach. He hooked up on his second cast and hung on. I was delighted for him, but he looked almost as tired as the fish. Who said angling is a sedentary sport? Now I was really fired up but I needed to have a look at some other spots, so that afternoon with a high tide due for about 6.00 pm, I jumped in the car and drove along the track to Middle Rock. Middle Rock, predictably sits between Flat Rock and Wreck Rock. It is a set of three rocky promontories that are almost completely submerged on the bigger high tides. It was approaching high tide when I started fishing there just after 5.00pm. I was using the light spin rod and was casting out a 1/6th 2/0 jighead loaded with a GULP Jerkshad in the Pumpkinseed colour. I was hopping the plastic over the submerged rocks pretty quickly so that it would not get snagged. Suddenly a fish smashed the soft plastic lure ran with it for a few metres, then dropped it. A few casts later and I was in contact with a fish again. It took off and took plenty of line. The light rod has no real strength so I had to wear this one out with the drag and use the waves to bring it in. It put up a good fight but it was solidly hooked and I soon had a 50cm Trevally at my feet. I think it was a Big Eye – but I am never quite sure as some of the species can look pretty similar. The sun had gone down by now and the south-westerly wind was chilling so I gave up for the day. Having seen the Tuna working just offshore, all afternoon the day before, at both Wreck Rock and Flat Rock, I decided to spend dawn on Friday casting slugs from the southern tip of Wreck Rock. The tides where getting bigger in the run up to the full moon. Low tide would be at 11.10 am, so there would be plenty of water close into the rocks, at dawn. The southern tip of the Wreck Rock bay has a couple of rocky outcrops and submerged bommies. At low tide there is only about a metre of water in front of them, but at high tide, this can increase to almost 4 metres. South of these rocks is a long, almost completely uninterrupted beach ( Rules Beach), that runs all the way down to the mouth of Baffle Creek. At the moment, the big seas and storms through the summer months have created a very steep, sloping beach with a few nice wholes and gutters. This means there is good deep water on high tide, all along this section. It was another bitterly cold morning, the sky was crystal clear, but there was a light south-westerly wind blowing. As the sun came up I was casting a 90g slug from the rocks. I then tried a River to Sea – Dumbbell Popper and various heavy blades and big hard bodies. I could not interest the fish. I could see the Tuna, in small groups, smashing into the bait fish and the birds diving in to get a free breakfast, but they stayed at least 800m away the whole time. I switched from the Daiwa 9’ 6” Demon Blood rod, which I use for slugs and poppers, to the light spin rod and rigged a soft plastic on a ¼ oz 1 jighead. I chose the GULP 2” Shrimp in the Banana Prawn colour. After about 30 minutes I had caught two tiny Dart and a Long Tom. At about 8.30am I headed back into my camp to thaw out with a hot cup of tea and some breakfast. I considered my options and spoke to another keen fisherman who was camped nearby. He too had seen the Tuna and was planning to spend the day casting slugs at them. As low tide approached I decided to head out the rocks on the southern tip of Wreck Rock bay. The Tuna were there but always just out of reach. They would swing in tantalizingly close and I would cast slugs at them then they were gone again. 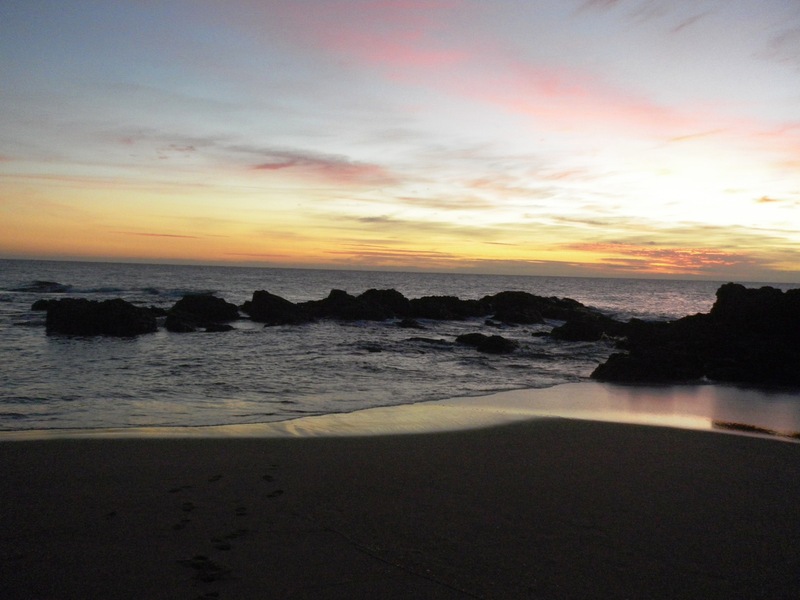 As the tide dropped I moved as far as I could out onto the exposed rocks to the south. I cast out at about 45 degrees to the shoreline and as my slug landed a huge circle of bait scattered around it. Then ‘zzzzzzzzzzzzzzzzzzzzzz ….fftt’ and the fish was gone. I wound the line back in and it looked like a clean bite through the 40lb leader. I presumed it was a Mackerel or some other toothy species. I rigged a wire trace and carried on, but after twenty more casts I was still without a decent fish. I switched from the slug rod to the light spin rod again and rigged a GULP Jerkshad in the Lime Tiger colour. I wanted to cast a bit of distance, but I also wanted to make sure the lure wafted around in the strike zone for as long as possible. I settled on a ¼ oz 2/0 jighead and downgraded to 16lb fluorocarbon leader. First cast was hit on the drop but then the fish dropped it. Third cast and I had a solid hook up. The fish took line in a couple of fast blistering runs then swam round in front of the rocks into a good position. On the next surge I tightened the drag and pulled it up to my feet (getting soaked in the process). Then I grabbed the leader and pulled the fish clear. 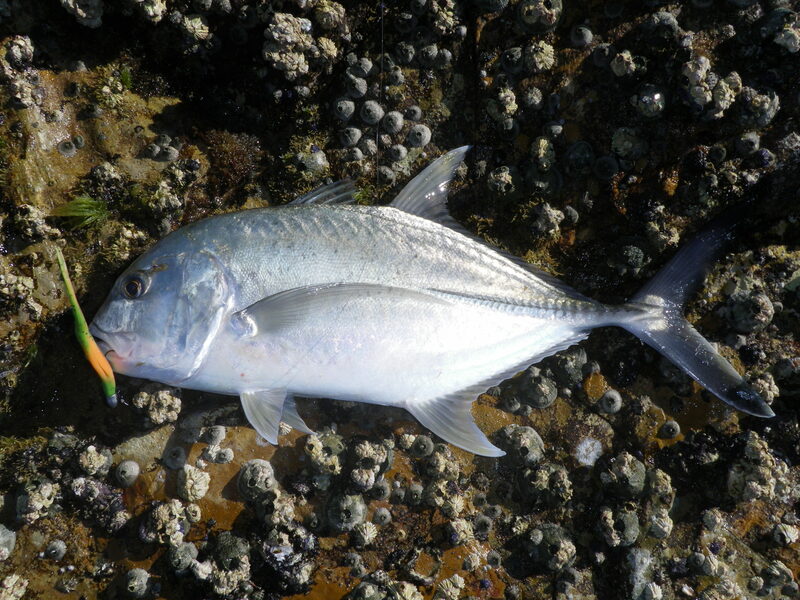 It was a Giant Trevally around 50cm – no monster, but a decent fish. Cold and wet, I decided I had enough – it was just after noon. As always when fishing an area that you have not been to for a while, you need to spend a few sessions figuring out what works and where the fish are. It was my fourth day and I finally felt I understood when and where to concentrate. I headed back to camp for some fish cleaning.